I don’t have too many Sally Hansen Insta-Dri polishes, but out of the few that I do have I love. My all time favorite white is Insta-Dri “Whirlwind White”. Sally Hansen Insta-Dri polishes are a drugstore brand that are supposed to be super fast drying and opaque in one coat, or almost opaque in one coat. The slogan is “One Stroke, One Coat, Done.” And for the cheap price tag and the genie looking bottles, I always check the line whenever I’m in a drugstore. So when I saw a few months ago on Scrangie that Sally Hansen released a few new colors in their Insta-Dri line I knew I had to check them out. Then I saw her swatches of this polish and knew it had to be mine! Sally Hansen “In a Flurry” is a black, or very dark charcoal grey, polish that has a ton of different colors of shimmer in there. There’s green, blue, silver, gold, and I’ve ever caught glimpses of purple! This is kind of similar to those “texture” finish polishes that I was talking about yesterday. From far away, it juts looks like you’re wearing a really dark charcoal grey but up close this baby sings. Formula wasn’t my favorite though. It was weird, it seemed a little thick when I took the brush out of the bottle and then when I applied it on the nail, it was rather runny. It was a little hard to control since the Sally Hansen brush is so wide, flat and hard (think a stiff short OPI brush). Also, this polish was a more sheer than I thought it would be. This is 2 coats, but I expected more from a brand that markets they’re polishes as 1 coat wonders. Dry time was really quick though, living up name Insta-Dri. Overall, its such a nice color and I can’t really be upset about a polish that takes 2 coats, since that’s the norm for most polishes. But it’s just so so, it wasn’t as stunning on my fingers as I expected it to be. What do you guys think? 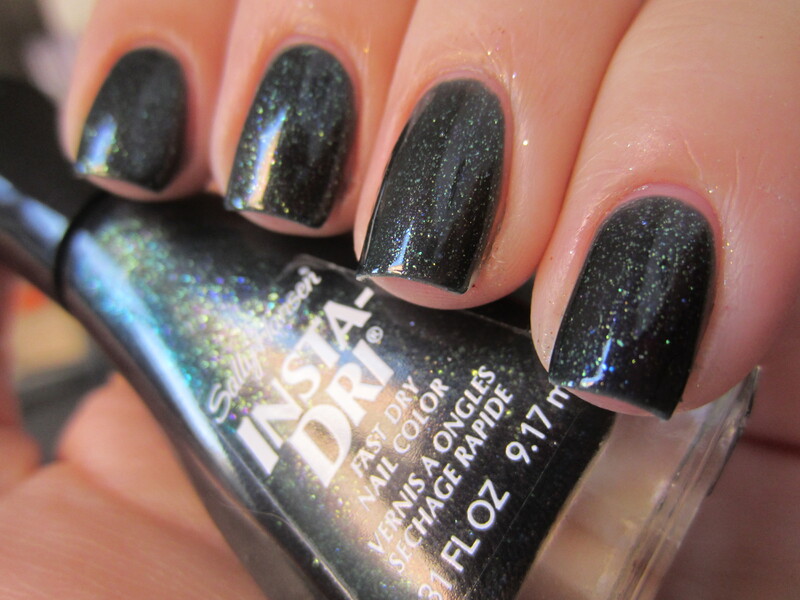 Do any of you have any Insta-Dri polishes? Is this your type of polish? Sally Hansen Crackle Overcoat Review! !